English Summary/英文概要： From the time of Ancient Sumeria, the heavy infantry phalanx dominated the battlefield. Armed with spears or pikes, standing shoulder to shoulder with shields interlocking, the men of the phalanx presented an impenetrable wall of wood and metal to the enemy. Until, that is, the Roman legion emerged to challenge them as masters of infantry battle. 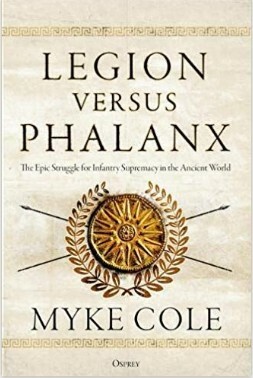 Covering the period in which the legion and phalanx clashed (280-168 BC), Myke Cole delves into their tactics, arms and equipment, organization and deployment. Drawing on original primary sources to examine six battles in which the legion fought the phalanx - Heraclea (280 BC), Asculum (279 BC), Beneventum (275 BC), Cynoscephalae (197 BC), Magnesia (190 BC), and Pydna (168 BC) - he shows how and why the Roman legion, with its flexible organization, versatile tactics and iron discipline, came to eclipse the hitherto untouchable Hellenistic phalanx and dominate the ancient battlefield. About the Author/作者介绍： Myke Cole has had a colourful and varied career, with service in war and crisis response. He began as a security contractor to the CIA, and transitioned into a federal intelligence position first with DIA (Defense Intelligence Agency), and then with the ONI (Office of Naval Intelligence). He commanded the reserve at US Coast Guard Station New York, where he was responsible for maritime law enforcement and search-and-rescue operations around the island of Manhattan. He went on to work for the NYPD in cyber threat intelligence, and currently works as a security and intelligence consultant in the private sector. He lives in Brooklyn, NY.